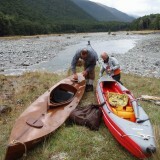 My good mate Steve Moffatt told me a story one day about his great, great uncle, George Park, and his brother James who in 1889 carried wooden kayaks from the West coast, up the Taramakau river, over Harper Pass and then paddled down the Hurunui via Lake Sumner and all the way out to the East coast. Then, George the crazy bugger, kept right on going down to Christchurch. George was very probably the first Coast to Coast athlete! We decided to re-enact the journey, a 13 day, 330km traverse dragging, lugging and paddling two kayaks the whole way. Moffatt did it as his forebears did with only the resources available in 1889. He found the original boat made 128 years ago, and got a replica made by Ian Franklin Boat builders, thus dubbed “Frankie”. George had used his sail as a tent for the trip and unfortunately for Moffatt, this made for a miserably small tent! I did it with all the modern stuff, neoprene, Gore-tex, and convenient dehydrated, freeze-dried meals from Back Country Cuisine. My kayak of choice for this trip was an Incept Tasman single inflatable kayak. It was almost identical in length and beam to Frankie, but it had a flatter hull, so it wasn’t as fast in a straight line, but it was much more versatile. I easily packed it away for the carry over the pass. 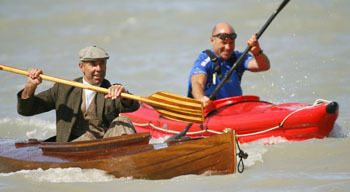 At 19 kgs it was less than half the weight of Moffatt’s wooden boat. It was impervious to the rocks, as it’s made of the same stuff as the white water rafts that Incept manufacture. I chose an ingenious after-market sail by Pacific Action. It is a light weight, pop-up design of 17 square feet that has a huge advantage over George’s set-up in that it can be hoisted or retracted in 3 or 4 seconds.George’s rig took a few minutes, and even then the mast had to be left standing. However, George’s rig was slightly more efficient and he could sail closer to the wind. Sound technology from 120 years ago! Despite the differences in sail size, we had similar speed. George and Moffatt used their sails for a tent, and both had only a woolen blanket for a bed. Rather conveniently, I could climb inside my inflatable kayak for a cosy airbed! It was great that I didn’t need to carry a tent or sleeping mat. The trip gave us a chance to compare lifestyles. 120 years ago they didn’t even have cars and there was no processed or packaged food. In 2008 we are supposedly more tuned in to ourselves physically and mentally than ever, fitter than ever, and have more stamina than ever. We wanted to test this. What really intrigues us was his attitude to adventure, risk and personal responsibility. What was life like in those days? What is the kiwi adventure heritage that we’ve inherited? The only hint we got at what food George actually had on the trip was illustrated in this delightful quote from the old newspaper clipping we found from 1890. Sandy Sandblom, our independent photographer, also showed Moffatt how to make Billy Bread. We couldn’t see how such a rudimentary recipe could sway our taste-buds from commercially made bread with all of the extra delicacies and technology available. But by crikey, Sandy was right! It was delicious! We quickly mastered the lining technique we’d copied from George’s photo. It was a fantastically simple but effective system; A stern line effectively pulled the kayak upstream. The bow-line kept the bow on a slight ferry glide, angled away from us on the bank, thus enabling the kayak to stay midstream whilst we saved considerable energy by staying out of the water, or at least in shallow water as we waded upstream. Clever fellow that George! Initially, I was pessimistic about the limits of being able to float the boats very far upstream. But the system worked really well. It was extremely convenient to have gravity negated by floating all of our gear in the boats. It was so much easier than carrying. Whilst George’s towing technique was simple, it still needed skill to operate it. Both Moffatt and I lost control of our kayaks at times. Moffatt crashed Frankie cross current and into a boulder reasonably hard on one occasion. It seemed innocently undamaged at the time, just a wee bruise in the timber, but this proved to be a sin that would re-visit later. The grunt over Harpers pass was infinitely harder than we’d ever envisaged! We copied George and James’ technique of doing shuttle loads. Taking Frankie up to the pass, we left all of the other gear at the Locke Stream Hut. The track was hellish steep, and was littered with hurdles like fallen trees, rock falls, slips and tight zig zag corners. Whilst it was a heavy load, Frankie weighed 40 kgs, the most difficult part of the load was coordinating with the other. When one of us slipped, which was frequent, the other had to stabilize with all of their might. We daren’t drop Frankie, for it would smash a terrible hole in it. Much of the time it was two steps up and one slip back. We’d have to stop every 20 metres for a break, as our heart rates maxed out. Finally, exhausted we stood on the Pass marveling at how fit those Park brothers must’ve been, because that same day they went back and got the second boat! There was no way we could do that. Wearily we descended back down to the hut daunted by the next day’s task of carrying the remaining gear and kayak up. 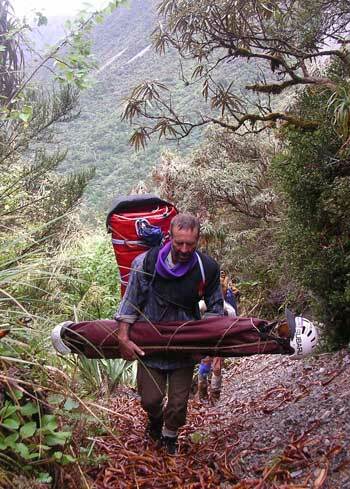 Those 2 days lugging gear over the pass shattered us, and we never recovered fully from that exertion. For the remaining 9 days to Christchurch fatigue accumulated and we got daily slower. It was not until the 5th day that we finally were able to paddle those damn kayaks. Quite ironic since it was a kayaking trip and we were on a river. 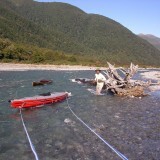 And even then it was just on selected bits of the Hurunui for it was still very skinny. I had a huge technological advantage now because I wouldn’t damage my inflatable as I scraped over rocks, so I could stay in the boat for shallow rapids. Finally the river deepened enough that we could fully float. It was utter bliss to rest our legs. It was the end of the shin bashing, the ankle twisting and the toe stubbing! We were 2 kms above Lake Sumner. we had traveled the best part of 45 kms, dragging or carrying our boats before being finally able to put in a paddle stoke. The lake was a blast with a wickedly good tailwind. I used my sail and felt pretty guilty at leaving Moffatt languishing behind. Out the end of Lake Sumner we were treated to lovely gentle rapids and an exciting wee gorge with class 2.5 white water. However, our nervous tension grew the closer we got to the class 3 White Water of Maori gully. We were anxious about smashing Frankie. By now James Park had already holed his boat, and the law of averages suggested that Frankie was due for damage. Moffatt’s kayaking skills had improved significantly, but both of us felt incredibly nervous at the thought of paddling the 3 worst rapids. Humour deserted us, and the trademarks of adventure, climbing heart rate and that old familiar adrenalin kicked in strongly. In the Press article we read that George and James actually roped their kayaks down the 3 worst rapids, but it would be extremely satisfying for Moffatt to paddle the entire river, source to sea. The gauntlet was laid. The temptation was huge, but so was the tension! Eventually we exceeded our safety threshold, deciding the risk was just too much, and we roped Frankie down these 3. Even then, there were some intensely stressful moments as we flipped Frankie, nearly sinking it. I paddled the entire gorge. It was much easier in my inflatable. However, the drama didn’t end there. Moffatt was stuck sideways. I leapt out of my boat and ran back to help. Sandy the photographer was not with us for the kayaking stages, so I stood there with rescue rope in one hand and camera in the other wanting to record the drama for our doco. It was an easy choice, Moffatt was at serious risk of drowning. Even if he did manage to extract himself from the tangle, Frankie would certainly be reduced to match-sticks. Carefully we worked together and all survived, the only injuries being pride and a small ding on Frankie. By now Frankie was leaking significantly. Those original sins were re-visiting us. Some of the earlier dings had swollen and forced the joints apart. No convenient Fibreglass repair kits in those days. Moffatt had come prepared, and as George would’ve, he screwed on some wooden patches. We quickly realized that George was not only a true adventurer, but also a very skilled boatman indeed. Extra-ordinarily talented, showing he was not only a clever kayaker, but also an exceptional sailor and boat builder. However, always the entertainer, Moffatt turned it on again, and this time we got it on camera. It was 2 days later attempting to land at Amberley beach. 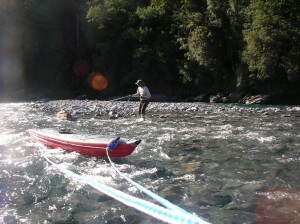 By now, the Hurunui river had found the sea and we were out on the briney blue. George was on his own by now as his brother had had to pull out at the Hurunui pub with a broken boat. When George got to the coast, seeing the wind was favourable, he cut himself a mast and rigged his sail. Moffatt also rigged his sail as we too had good winds. Good winds, unfortunately, made for rough seas and a sizeable swell. Moffatt was shaky nervous about the landing and rightfully so, as Frankie, with no rudder and a 2 metre mast was not an easy boat to nurse in through a dumping beach break. I landed first and stood on the shore with camera. Moffatt timed his run between sets and caught a small wave in the last few metres. Safety of the shore was a mere few metres away. The wave rose up steeply and unceremoniously rolled and tumbled Frankie. The mast snapped off on the first revolution, and then there was a mishmash of boat, sails, booms and de-throned Moffatt tumbling over and over. I had those vibrant visual images I so easily conjure up, of the stump of the shattered mast protruding from Frankie impaling Moffatt, and the blood was a vivid scarlet. It made good footage, albeit shakey. Moffatt learned a good lesson about being more assertive with brace strokes and aggressively railing the bilge of the boat in a broach situation like that. Just as resourceful George would’ve been, we scrounged through the campground rubbish piles and eventually found an old tent pole. Moffatt thought that George must have been looking over his shoulder, as it was an amazing coincidence to find such a lovely piece of Oregon that was the exact length of our broken mast. Moffatt’s subsequent beach landings were textbook perfect. We finished the trip without any further drama, and we not see any of the sharks that the Press reporter warned George to watch out for. We were accompanied by dolphins, a flock of Gannets, and spotted numerous seals down the coast.We finished exhausted but reflective. We’d survived, our bond of mate-ship was hugely strengthened as only it can be, when two mates depend on each other for safety and survival in nature. Most importantly, we’d got a very good look at what life was like for George Park and those other pioneering adventurers of early New Zealand. Those adventurers were tough bastards. There was so much more unknown then. Their trip outcomes were less predictable. They needed to rely on their own skills and judgment of risk more than we did. Their level of personal responsibility was far greater than ours. We’re so inspired by the Harper Pass trip that we’re going to do more. Moffatt discovered George and his brothers were the first Europeans to canoe Cook Strait. There were some other mad keen Rob Roy canoeists. 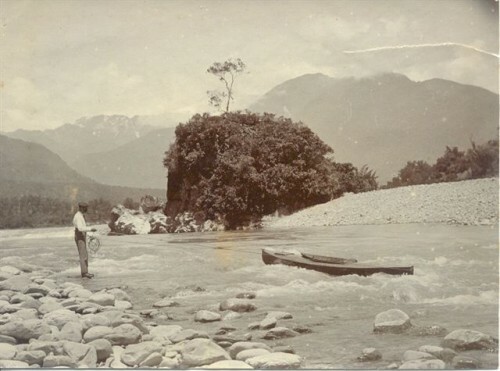 George Mannering and Marmaduke Dixon attempted to climb Mt Cook and then paddled out to the east coast. They also paddled from Bealey to Kaiapoi, hitching a ride to Christchurch in a horse drawn cart in time to attend the Canterbury Jockey Club ball, all in one day!